In SWAT! 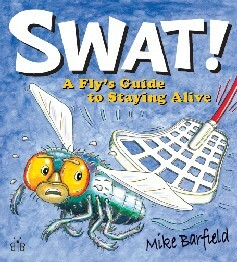 just-hatched housefly Buzzter gets instructions from Professor Hector Halfbottle on how to survive the dangers in life, like being eaten by various animals and plants or killed by humans. This book is scientifically accurate and as it is about poo, flies and death, and lots of jokes, even boys will surely love to read it. Plants Some plants get the extra food they need for growth by catching and eating US! Some are sticky, others are tricky! Avoid all these potted rotters, young Buzzter! --- I’m scared! Don’t worry - SuperFly will protect us! Every page in it is covered in colourful cartoon images and witty words...If you are young, or young at heart, buy this book! - The Bug Club Magazine"